A. Color Mode. This option controls how the colors are generated for the line. Here is a description of each mode. 1. Single Color. When this option is selected, the patterns are draw with a single, constant color. 4. Phase Gradient-2. In this mode, the program changes color in responses to the phase relationship between the two small wheels. Since the program draws certain parts of the pattern when the phase relationship is at certain values, using this mode causes interesting color patterns. 5. Distance Gradient. In this mode, the program changes color based on the distance the pen is from the center of the drawing. This results in circular patterns of color in the drawing. 1. Edit Gradient Colors. The gradient defined by the starting and ending colors. You can edit the starting and ending color of the gradient by pressing the Edit Buttons at the start and end of the gradient. 2. Steps Per Cycle. This option applies to the "Step-Gradient" option described above. The value specifies the number of steps it takes to cycle through the complete color gradient. The larger the value, the longer it takes to progress through the gradient and the more subtle the color changes. Likewise, the smaller the value, the quicker the program progresses through the gradient and the more dramatic the rapid the color change. 3. Step Count. This item displays the number of steps that have taken place since the count was reset. 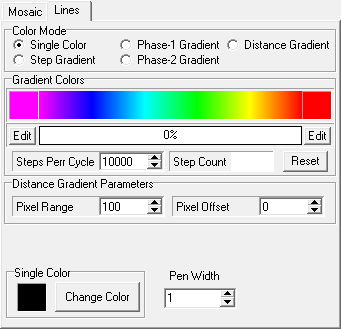 In Step-Gradient mode, this count is used to determine the current pen color. 4. Reset Count. Pressing this button sets the step-count to zero, which puts the pen color at the beginning of the gradient. 1. Pixel Range. This value controls how many pixels in distance from the center it takes to move across the whole color gradient. For example, if the value is 100 when the pen is 99 pixels from the center, the pen-color would be the last color in the gradient. If pen moves beyond the 100 pixels from the center, the color starts over at the beginning of the gradient. The Pixel-Range value allows you to tailor the colors so the full gradient is applied to the pattern. For a smaller pattern, you'd use a smaller pixel-range. For a larger pattern, you'd use a larger pixel-range. For example, if the pattern had a 235 pixel radius, setting the pixel-range to 235 would cause the full gradient to be applied to the full object with on wrap-around. 2. Pixel Offset. The pixel-offset value allows you to shift the color gradient on the drawn pattern. For example, setting a pixel-offset of 100 for a 200 pixel-range would shift the starting color to the middle of the range. D. Single Color. This option allows you to set the line color for "Single Color" mode. E. Pen Width. This option allows you to set the line width of the drawing-pen in pixels. For example, if the value is set to two, the line would be two pixels wide.